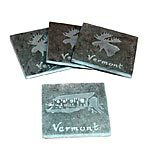 Check out Vermont Stoneworks slate products! Reminiscent of Vermont, these items make wonderful gifts (especially for men) or choose something for yourself! Typically grey/green or purplish in color, the slate occasionally comes in a beautiful mottled combination of both. A natural product, the slate sometimes has variations in grain, color and markings that only enhance the natural uniqueness of each piece. The thermometers are perfectly suited for indoor or outdoor use; the coasters also work wonderfully as candle plates. These slate products are hand-crafted in Springfield, Vermont.